SOLD A Correct Draft of the North Pole (plus 5 pages of text). Size: 15.75 x 18 inches. From: NAVIGANTIUM ATQUE ITINERANTIUM BIBLIOTHECA or A Complete Collection of Voyages and Travels. Consisting of Above Six Hundred of the Most Authentic Writers, Beginning with Hackluit, Purchass & Etc. in English; ..." by Harris. A highly detailed map by the English cartographer Emmanuel Bowen that shows the tracks of navigators in their numerous attempts to find the Northeast and Northwest Passages. The northern shore of Baffin Bay is still undefined and Greenland is explored only to 75 degrees North. 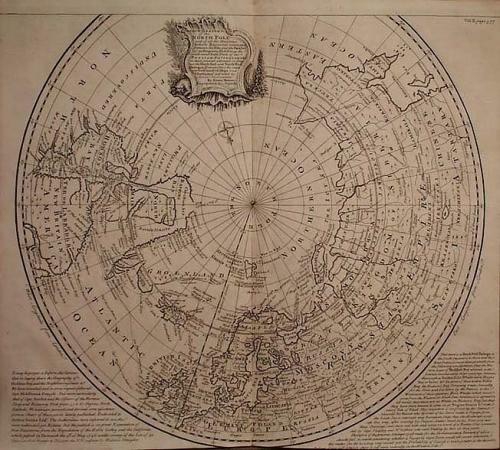 This map is accompanied by Pages 377-386 (5 leafs) of the original text from the books which contains part of Chapter 1, 'The Discoveries made directly towards the North, and the Attempts hitherto made for finding the North-East and North-West Passages'; Section 1, 'The History of the Countries lying round the North Pole, their Climate, Soil, and Produce; together with an Account of the Customs, Manners, and Trade of their Inhabitants'. The map is in excellent condition and the text pages that are included with it provide a wealth of background information.